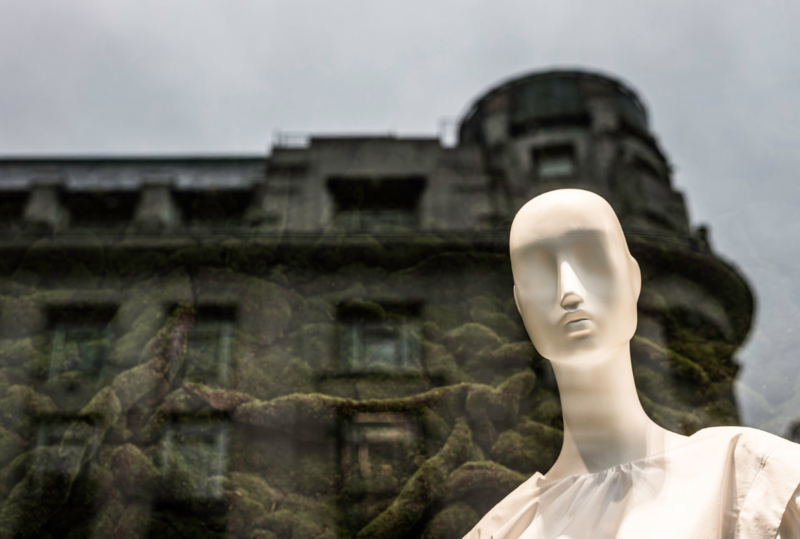 Most companies use some form of advertising to let customers know more about their product. 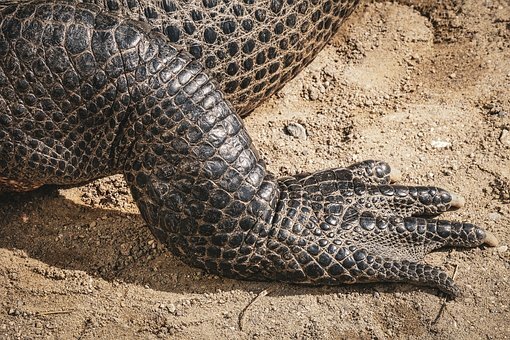 These 10 businesses took promotion to the grandest extreme and constructed cool buildings in the shape of what they are trying to sell or promote. The attention-getting factor is obvious with these novelty architectural structures. Whether they are in the shape of giant shoes or enormous hot dogs, these creative buildings draw the curious crowds like bees to honey. Under the sun scorched blue skies of La Puente, California sits one of the world's most surprising bakeries. In the shape of two larger-than-life doughnuts, this business has sold exactly what it advertises- doughnuts and more doughnuts since 1968. 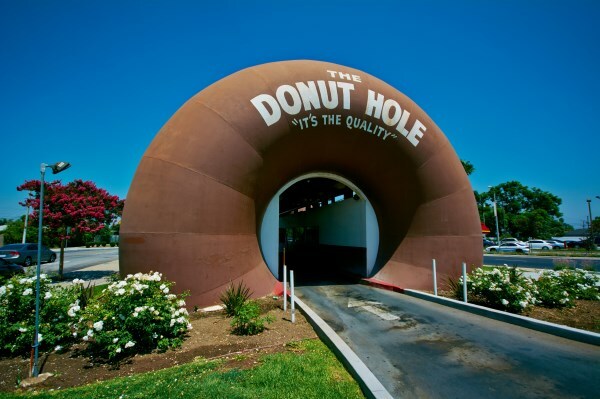 Drive in through one 26-foot fiberglass piece of pastry, order at the bakery window in the center, and drive out through a matching doughnut on the other side. It may be a strange way to order a box of crullers, but a cool building like this certainly succeeds in drumming up customers. In the tiny village of Bathurst, South Africa is a very ambitious building. Here you will find the biggest pineapple on Earth. 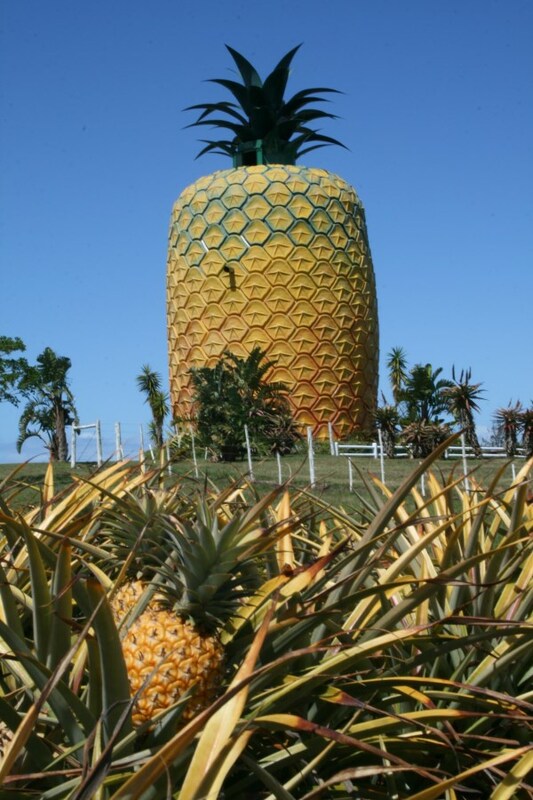 Standing nearly 55-feet tall and located on the Summerhill Estate pineapple plantation, this cool building has three floors which hold a 60-seat auditorium, a gift shop selling pineapple products, a museum dedicated to the cloying citrus, and a 360º observation deck. 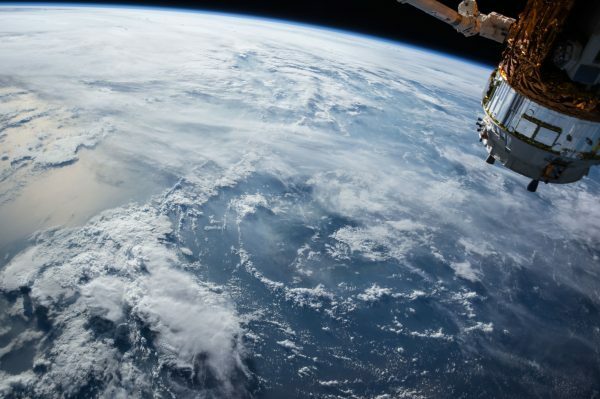 Built between 1990-1992, it is made from steel and concrete with a fiberglass outer skin. As tourists on the deck gaze at the panoramic view of the prickly pineapple crowns being farmed below, they may clutch their purchases of pineapple chutney and fruit-shaped pottery and feel a certain satisfaction that bigger can often be better. Built as a private home in 2007 by the first president of the World Toilet Association, this 2-story building, built in the shape of a giant loo, now functions as the Toilet Museum. 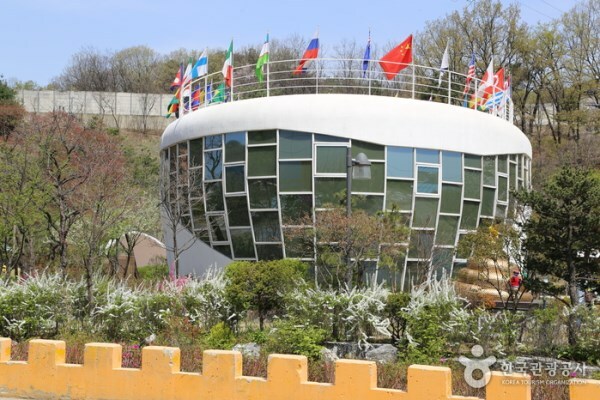 Located in Suwon, South Korea and surrounded by Restroom Cultural Park, this 4,508 square foot museum displays toilet-themed works of art, European bedpans, squat toilets, and lavatory signs from around the globe. There is even a gift shop selling souvenirs, which include smiley-faced poop-shaped toys. Meitan County in the Guizhou province of China is known for being the main producer of green tea in the region. 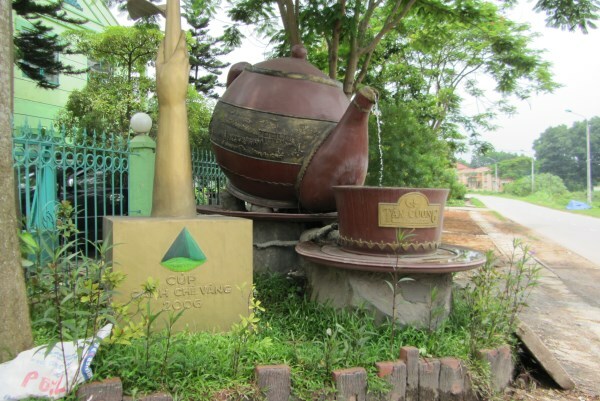 So it is not surprising that a building in the shape of a gigantic tea pot, with an added tea cup next to it, would be constructed as a commemoration to that industry. Inside you will find a museum dedicated to all things tea related, as well as a hotel where tourists can imbibe a steaming hot cup. Nearly 245-feet tall, this building has set the record for the largest tea pot in the world. That's a whole lot of tea. 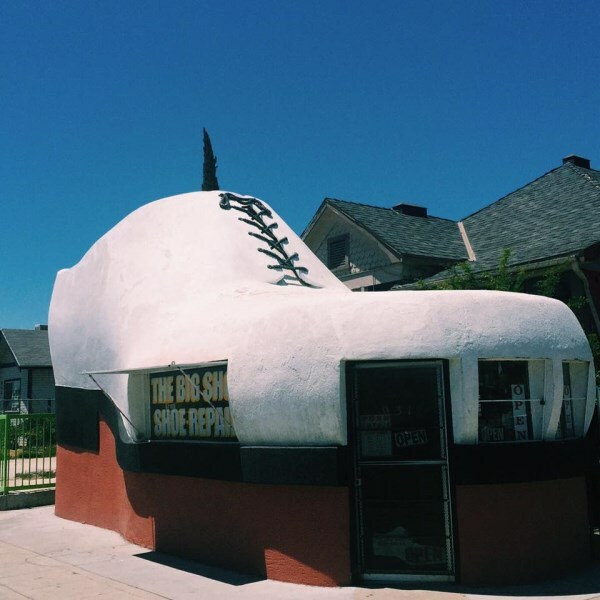 Although there are several shoe-shaped residences that exist in the world, Bakersfield, California may have the only business where you can get your heels repaired inside of a shoe. Built in 1947, this 30-foot long building houses a cobblery business. It is unique in that the roof features a working shoelace made out of a 50-foot long rope. Even government agencies occasionally join in on the novelty architecture craze. 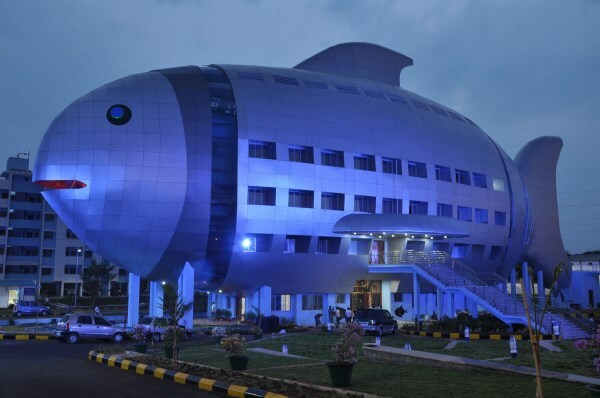 This 4-story fish building was constructed in 2012 to function as an office for the National Fisheries Development in Rajendranager, Hyderabad, India. In the belly of this colossal flounder, work is being done to expand technology for India's fisheries and aquaculture. Entrance to the building is beneath a silver fin. Do you need to buy or rent a piece of heavy machinery for a home remodel or a landscape project? There could be no better place than this bulldozer-shaped office building in Turlock, California. 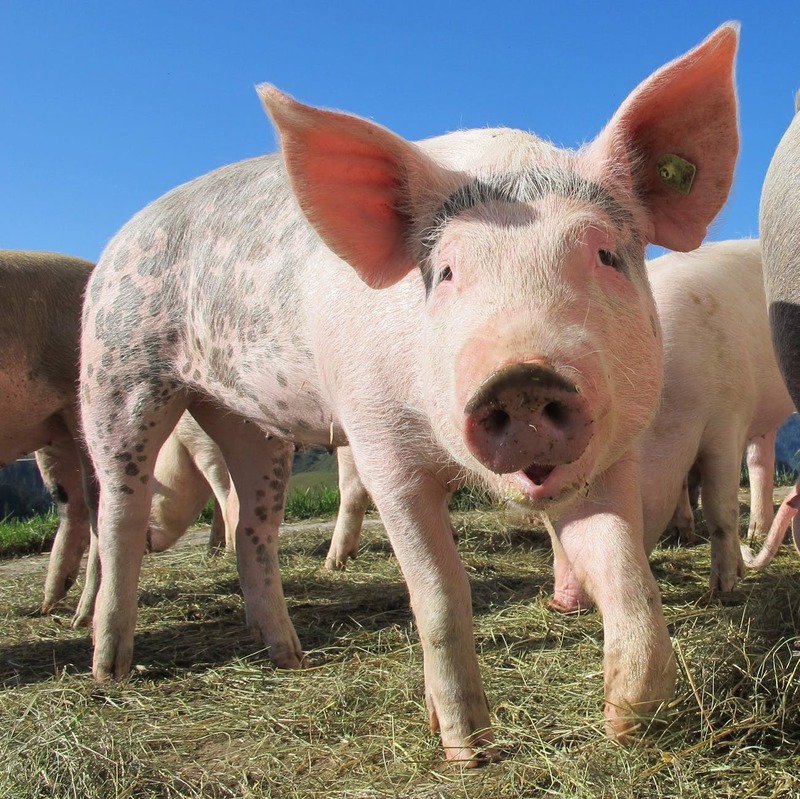 It is owned by United Equipment, a company that specializes in construction machinery. 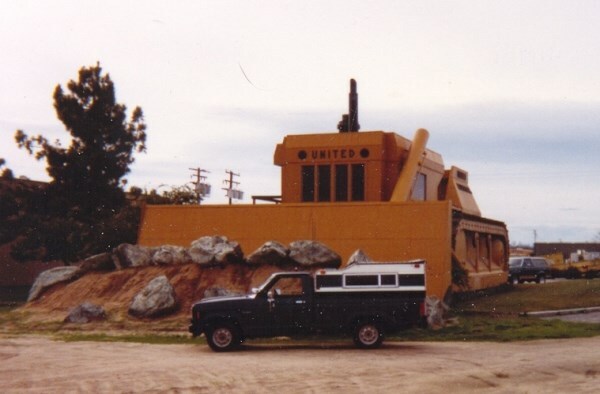 Built in 1976, this office masquerades as a massive Cat D5 bulldozer and is 2-stories tall and 66-feet long. Its giant scoop appears to be pushing a pile of rocks in its path. 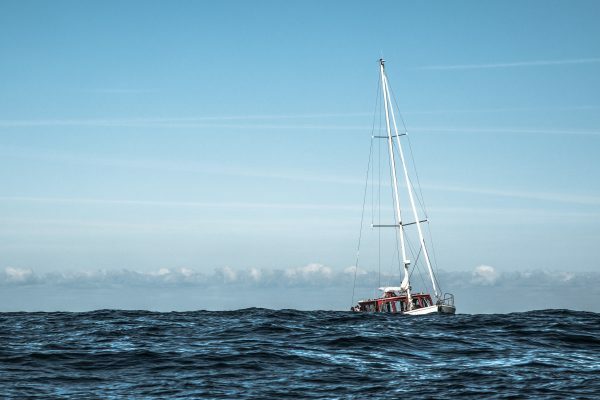 Although it looks ready to move mountains, its offices inside are actually quite normal and sedate. 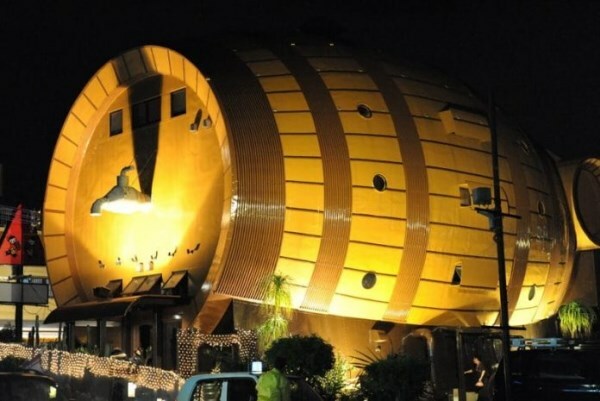 Have a pint of beer or something stronger poured for you inside of this monstrous keg-shaped building located in Okinawa, Japan. The Tonneau Bistro & Bar is 4-stories tall and serves both food and drink. As an added benefit, it comes complete with a giant spout. 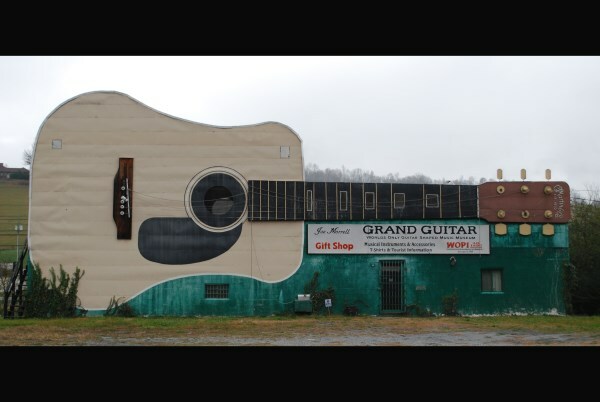 Grand Guitar in Bristol, Tennessee bills itself as the "World's Only Guitar Shaped Music and Gift Shop." Located in an area renowned for its country and bluegrass music, this 70-foot long guitar-shaped building also functions as a museum where people can view instruments on display and see memorabilia from performers. 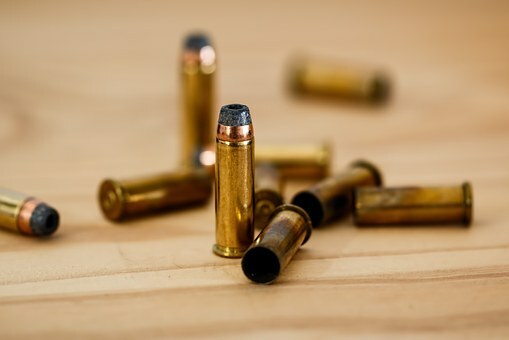 One of the first nationally distributed country music records- by the Carter Family and Jimmy Rogers- was made in this town in 1927, so it comes with history. The building itself was built in 1983 and is 3-stories tall. The guitar's sound holes are also its windows, and its strings are made of nylon rope. 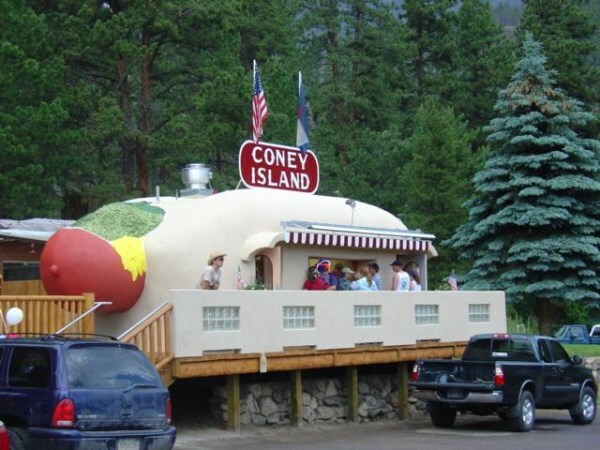 Shaped like a massive hot dog with a stucco bun, complete with mustard and relish condiments, this diner in Bailey, Colorado serves up greasy American food. 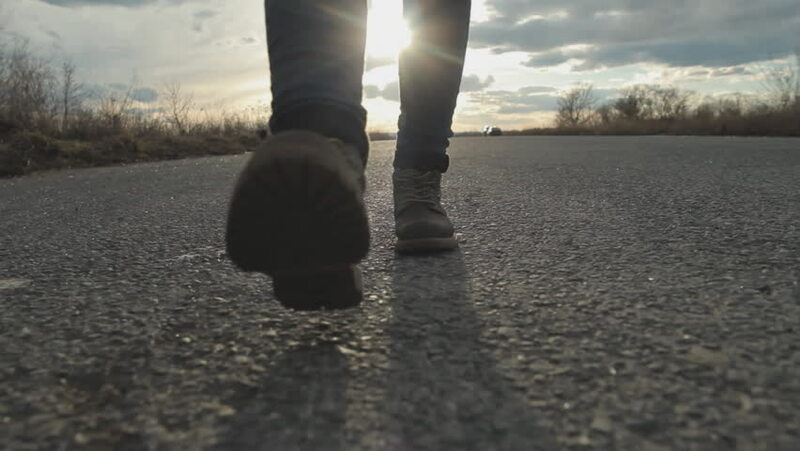 Built in 1966, it was originally located in Denver until 2006 when it was moved to the town of Bailey. With built-in seating inside of the wiener it is a popular tourist attraction.